When civilization was rebuilding following an inter national plague, the epicenter of humanity was Chautauqua Auditorium in Boulder, Colo. At least that’s how it happened in Stephen King‘s The Stand, an epic tale of apocalypse, atonement and the will to persevere. So it was fitting that, in the aftermath of the floods that devastated Colorado’s Front Range, particularly Boulder, a crowd of more than 1,200 gathered in Chautauqua on Sept. 26. But this time it wasn’t to hear from Stu Redman or Mother Abigail. It was to hear from the man himself. “This is where the first Boulder Free Zone meeting was held, right here in this auditorium,” King said early in his talk before a sell-out crowd. King, his wife Tabitha and two of their children briefly lived in the city in the mid-’70s, following the publication of King’s second book, ‘Salem’s Lot. He authored two of his most famous novels in the shadow of the Flatirons, The Stand and The Shining. So it’s only fitting that he returned to Boulder to celebrate the release of Doctor Sleep, the long-awaited sequel to The Shining. “I wanted to see if my old King Soopers was still there,” King joked, referring to the grocery store in his former South Boulder neighborhood. It’s still there, as is the Stanley Hotel an hour up the road in Estes Park. King recalled fondly his mountain writing studio and the inspiration he felt there. King’s innate talent and creativity was likely aided by a progressive, anything-goes attitude of a college town in the foothills undergoing the growth spurt that transformed it into one of the country’s top-rated cities—an epicenter of technology, education and craft-brewed beer. A second vehicular mishap provided the inspiration for another King classic. His car broke down in Boulder Canyon, and he was walking into town for assistance. While crossing a bridge, he noticed the clack of his cowboy boots on the wooden planks. He wondered: What might be underneath this bridge listening to his footfalls? Perhaps a clown—and thus the seed of Pennywise, the supernatural killer in It, was planted. 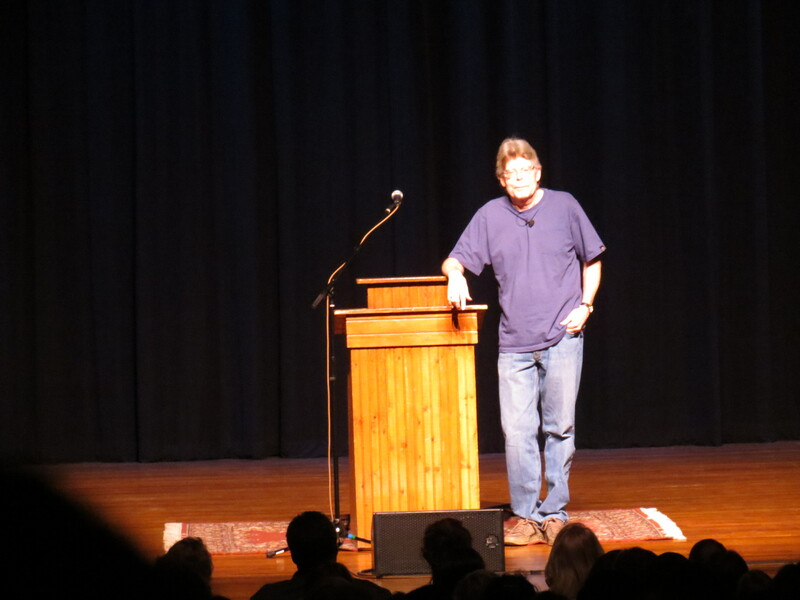 But the book he was really here to talk about was Doctor Sleep, which hit shelves on Sept. 25. He was fascinated, he said, with the cyclical nature of family dysfunction, how children of abusive or alcoholic parents tend to repeat that behavior as adults. So it’s fitting that Danny’s adult life is, well, complicated. Now in his 40s, Danny is a hospice worker in New Hampshire, where, along with the help of an intuitive cat, he helps suffering patients come to rest. But though the novel begins in New England, it inevitably takes to the road. And that road could only lead to one place. “Eventually, he has to go back to Colorado and to Boulder,” King said. He read excerpts from Danny’s return to the city, which involved a particularly nasty hangover and an over-the-top gross-out gag that will have his most hardened readers choking up. It is a sequel decades in the making, and a return to one of King’s greatest triumphs. This is a treat for long-time fans, and new ones. During the Q&A, a question came from a fan who started reading King in their youth, and now their kids are reading the books. “I think it’s nice when people pass the book down from generation to generation,” King said. But his literary legacy includes more than his books and films. It also includes his offspring. His youngest son, Owen, is the author of Double Feature, and his oldest son is best-selling author Joe Hill. Joe and his dad have collaborated on two novellas and often share ideas when writing their books. For example, they were simultaneously working on Doctor Sleep and Hill’s NOS4A2, and each included a scene in which their characters cross paths. “In a strange way, it’s almost like writing with another part of myself,” King said of his collaborations with Joe. Doctor Sleep will certainly bolster the already absurdly rich King oeuvre. It will take readers back to some cherished places, both physical and psychic: Boulder, the Overlook Hotel and one of the finest and most terrifying works of psychological horror ever penned. And together, we will once again croak our favorite and most-haunted mirrored phrase: RedRum.